I do believe i know enough to make a conclusion about the plier used on Wenger New Ranger knives. It is a plier made for the outdoors with enough size and with enough versatile design for the medium to light duty tasks. For use around cooking or hot items it is very good. For fishing it is also very good. The wire cutters are not for hard wire and this is the only part I wish could be improved on the pliers from Wenger + the steel. The pliers do have a good size and it is a very comfortable one to use because it is spring loaded and therefor it can be used for fine control. The needle nose design will make it able to be used in tight places. It can be opened with one hand and closed with one hand. It can be used to turn bolts and screws with comfort. I did use it on sharp nuts made of tough steel and this damaged some parts of the notches on the inside of the plier design. It does not influence the functionality any so far. The steel used on the pliers are on the softer side and it did not break when I applied some force to open a bolt. This plier is very good for removing fishing hooks from fish and this with control. The combination plier and the metal file/saw are not to be under estimated. I would say if the metal file/saw is on then it is a combination that will be top notch. The text above is gathered from received information and from personal use and tests. I do miss the hard wire cutter function and harder steel used on the pliers. It does perform 100% for what is was made for. It is the best pliers for fine control that I have ever used on SAKs and multi-tools. It is not very comfortable when force is applied on the grip because of the lever handle design. It will have some flexing that is a bit too much. It is the absolute most interesting pliers and the absolute most precision made pliers I have ever seen. The pliers in combination with the main knife blade are a very good one for many tasks. The pliers are also very good for combination tools that are separate. This will increase the versatile abilities by 100%. The use of the hex opening for bits and tools increase it by another 100%. Remember to have a clean and oiled plier at all times. 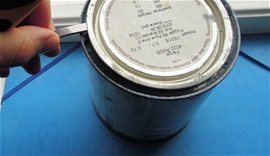 This will prevent rust or any corrosion usually and make sure the performance comfort is there. Remember when you use it on hot items in camp or for cooking that you do not leave it next to a very hot device for a long time because this can damage the tool and SAK. It is very comfortable pliers when used correct. Did you know that the lever arm from the pliers in open mode can be used as a light pry function and it can be used to adjust a device? The answer is yes because it got a rather sturdy design and it is well rounded to avoid damage on equipment. If you have been around weapons and equipment than you already know the possibilities on this lever arm. The SAKs are no weapons but it can be used to make things and for use on weapons. It is important to improvise and see new possibilities. The advantage of the lever army is there compared to traditional multi-tools. The New Ranger plier is excellent for nick nacks and shackles. These are no fun opening when corroded or cold. The plier is an extension of the human hands. Shackles can be very uncomfortable to open when your hands are cold or injured. Shackles are not comfortable to open anyhow. 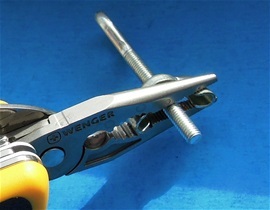 With the Wenger plier it is comfortable and easy to open most shackles. When corroded it can be a bit more difficult. 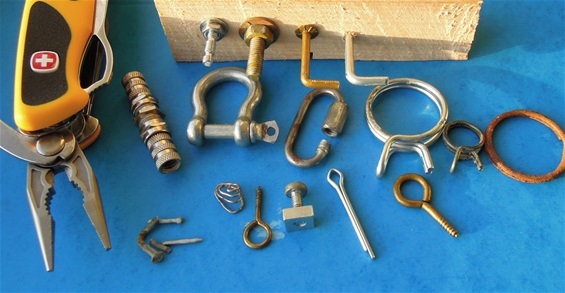 Remember that the most important thing with a shackle is to tighten it so it does not open by accident. The New Ranger plier is excellent for this. 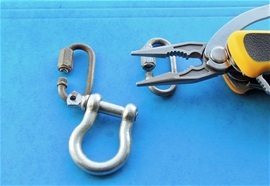 A shackle opener is the best maybe but most people do not care that there will get some scratches on the shackle pin guide. To bend a hook back into position requires a plier that can take some force. On the small to medium size hooks it is no problem bending a hook. The type on the right is too big and can damage the plier. It can probably be done depending on how you use it but I would not recommend it. To remove the large-xl size hooks from the fish it is no problem but a blunt nose wide grip plier is the best. On smaller fish and on the small to medium size hooks the needle nose plier is comfortable and very good. I do believe like I have explained that it is a medium to light duty plier that can give some extra control. It is also extra comfortable on smaller fish because of this. Small to medium size hooks are usually what most people use anyhow. Another important factor that people need to know is the wire cutter function. Everyone that has experienced to get a hook in the finger knows that you will need a cutting tool after you push the hook through the finger. The wire cutter on the New Ranger plier can cut small hooks only. I know the Wenger plier has been tested in different climates and temperatures. This includes extra low minus degrees. The minus degrees we have had here this winter would not be able to make any difference at all so that is no issue. I have never heard any problem with this anywhere. I would believe if it would be extreme temperatures that this may influence the metal. This is so on most things today. Sometimes it is not the cold itself that is the problem but ice or other things that can get in the way of the mechanisms when you use it. So far I have never heard any problem from any person or any information yet. Here is a small trail you can do that the Wenger plier will do well. The wire cutter is just for the possibility that it can cut but it is not for harder tasks. If you want to avoid damage on the wall hook types you see in the wood then just use some tape on them. The plier is very handy for turning them so you can avoid using the fingers. A safety pin for a propeller is also something you could need a plier for. 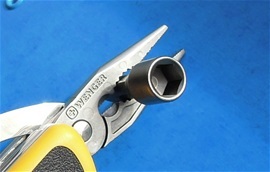 The Wenger plier used on the 130mm is basically a type used in the outdoors but also for the handyman depending on use. Because it is for medium to light duty and because it is a needle nose design then one should use it according. Remember when using the plier for bending purposes that you are aware of the flexibility in the plier design. This flexibility is to some extent. For sure it can be used for some bending tasks and remember to take advantage of the design so you avoid damage. If you use the lever arm for the plier for some small tasks that you remember not to put strain on the mechanism itself. The Wenger plier is a very good helpful function for many tasks but this does not mean you should over-do it. This plier is very good for fine control and to reach components in a computer or electronic devices. This is because of the needle nose design. 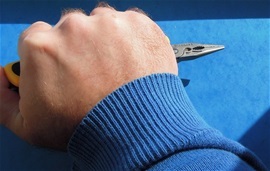 The plier tip is smaller or narrower that the component you pull out or turn. This plier is also very good for wingnuts of different sizes. With this wing it is enough opening towards the threads. It does not touch! Different polished metal pins can be very difficult for the fingers. not hard for the plier. 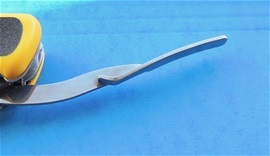 The advantage with a needle nose design is that the tip also can be used for a push device for slim metal pins. Have you ever lost a small device in a crack and you cannot reach with the plier? With a magnet on the tip you can get the extra! Remember that a Swiss Army Knife is made in the tradition and remember to honor it for what it is. It is a tool. It is all good! Hope I have helped to give a certain guide on the versatile use of a plier. For sure you can use the plier to the left in an emergency or down on the ice. I have not heard anyone thrusting upwards yet. For sure i heard someone that did break a car window as a test with a plier in his right hand.